AACHEN, Germany, March 10, 2016 — Laser-based technologies that overcome the challenges of processing composite materials — which offer high strength and light weight — hold promise for the automotive and aviation sectors, as well as new applications. Composite materials such as CFRP and GFRP (carbon- and glass-fiber-reinforced polymer, respectively) are becoming staples of industrial series production, but the materials are difficult to work with. Now the Fraunhofer Institute for Laser Technology (ILT) has developed an range of laser-based technologies for processing composite materials, enabling short cycle times and consistent quality. Carbon-fiber-reinforced plastic is difficult to process because it is composed of two vastly different components: high-strength, temperature-resistant carbon fibers and a soft plastic matrix. The thicker the material is, the harder it is to achieve an undamaged cutting edge. Fraunhofer ILT reports specialized laser technology that was developed as part of the European Union-funded HyBriLight project for industries that include the aviation sector. The institution said the laser passes multiple times over the cutting contour at high speeds, which minimizes material damage. In the automotive industry, a problem has arisen from the need to reliably and permanently bond dissimilar materials, such as plastics and metals. Fraunhofer ILT said it has developed a two-step process to address bonding. First, the metal surface is structured with a laser. Afterward, the plastic is heated with a laser or an induction heating device, and then bonded with the metal part. Unlike adhesive bonding, the process doesn’t require additives or additional intervals for hardening or surface cleaning. When preparing the metal side, the microstructure can even be adapted to the workpiece’s subsequent force flows, meaning the metal components can be made as thin and lightweight as possible. The technology was developed within the European Union’s PMJoin project, together with partners from the automotive industry. Partners in the FlexHyJoin follow-up project are currently working on a fully automated version of the process, Fraunhofer ILT said. Screws and rivet fittings represent the traditional force-transmission elements for metallic components, but integration of such functional elements becomes far more complicated in the case of fiber-reinforced plastics, especially with regard to the the placement of drill holes to create form-locked or friction-locked connections. As part of the LaserInsert project, funded by the German Federal Ministry of Economic Affairs, the Fraunhofer ILT team is currently honing a mass-production-ready, laser-based process to address this issue. First, an ultrafast laser is utilized in order to ablate holes in the textile preform before it is being impregnated with resin. Afterward, a metal insert is placed and subsequently the resin matrix is applied. The final result is a consolidated work piece featuring a metallic-fiber-reinforced polymer hybrid structure. 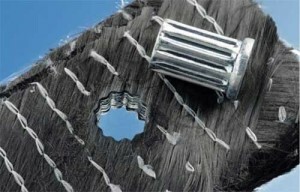 In addition to optimizing processes, the project partners are also working to enhance the textile structures, which, in combination with laser processing, offer improved locking and friction joining properties with the insert fasteners, Fraunhofer ILT said.